In this paper, we introduce a new lattice reduction technique applicable to the narrow, but important class of Hypercubic lattices, (L ≅ ℤN). Hypercubic lattices arise during transcript analysis of certain GGH, and NTRUSign signature schemes. After a few thousand signatures, key recovery amounts to discovering a hidden unitary matrix U, from its Gram matrix G = UU T . This case of the Gram Matrix Factorization Problem is equivalent to finding the shortest vectors in the hypercubic lattice, L G , defined by the quadratic form G. Our main result is a polynomial-time reduction to a conjecturally easier problem: the Lattice Distinguishing Problem. Additionally, we propose a heuristic solution to this distinguishing problem with a distributed computation of many “relatively short” vectors. J. Hoffstein, N. Howgrave-Graham, J. Pipher, J.H. 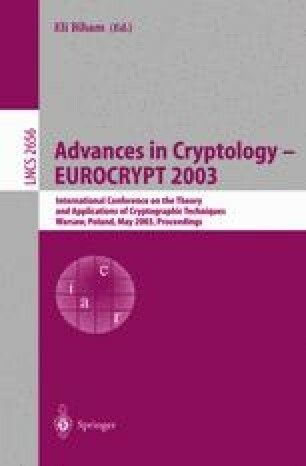 Silverman, W. Whyte, NTRUSign: Digital Signatures Using the NTRU Lattice, December, 2001. Available from http://www.ntru.com. J. Hoffstein, J. Pipher, J.H. Silverman. Enhanced encoding and verification methods for the NTRU signature scheme (ver. 2), May 30, 2001. Available from http://www.ntru.com. J. Hoffstein, J. Pipher, J.H. Silverman, NSS: The NTRU Signature Scheme, preprint, November 2000. Available from http://www.ntru.com. J. Hoffstein, J. Pipher, J.H. Silverman, NSS: The NTRU Signature Scheme: Theory and Practice, preprint, 2001. Available from http://www.ntru.com. J.H. Silverman, Estimated Breaking Times for NTRU Lattices, NTRU Technical Note #012, March 1999. Available from http://www.ntru.com. Consortium for Efficient Embedded Security. Efficient Embedded Security Standard (EESS) # 1: Draft 3.0. Available from http://www.ceesstandards.org.